Engraved map by Nicolas Bellin. The engineer-geographer Nicolas Bellin (1703-1772) worked for the French Ministry of Marine, in the hydrographic office or the ‘Depot des Cartes et Plans de la Marine’. His major work was the series of nautical charts known as the Suites de Cartes Marines, the first of which he published in 1727. These were maps of the coasts of all the known seas around the globe: the Neptune Française, containing charts of the French coasts, appeared in 1733; the Hydrographie Française, with charts of the coasts all the known seas, appeared in 1756. The Petit Atlas Maritime was made at the orders of the Duc de Choiseul and appeared in 5 volumes in 1764. It contains the same maps as his other works, but on a smaller scale for detailed work; it consists in great part of harbour plans. Bellin’s works contain most of the known cartographical information of his time, but his sources are unknown. Goletta, or La Goulette, is the old port of Tunis. The topography of Tunis is curious; it is situated on an isthmus between two salt lakes. The salt lake between Tunis and the Mediterranean is called ‘el-Bahira’ or the Lake of Tunis. Goletta is at the end of this lake and forms the gateway to the Mediterranean. It consists of a spit of land with two forts, a small fort at the tip of the spit, and a large one on the other side of a canal that divides the spit in two. This spit of land divides the Mediterranean from the salt lagoon which borders the city of Tunis. Goletta was of considerable importance for the protection of the city. In 1525 internal dissension gave Barbarossa Khaireddine an excuse to seize the city of Tunis in the name of the Ottoman Sultan; in 1535 Goletta was attacked by Charles V of Spain who seized Barbarossa’s fleet, the arsenal and 300 cannon. The Spanish controlled Tunis and several other points on the coast for about 35 years, until the Ottoman Turks regained control of the country. Goletta’s importance both as port and fortress declined throughout the 19th century, especially from 1893, when a ship canal through the shallow lagoon was opened directly to the city. 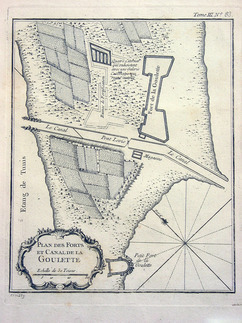 Published in the Petit atlas maritime recueil de cartes et plans des quatre parties du monde, volume 3. 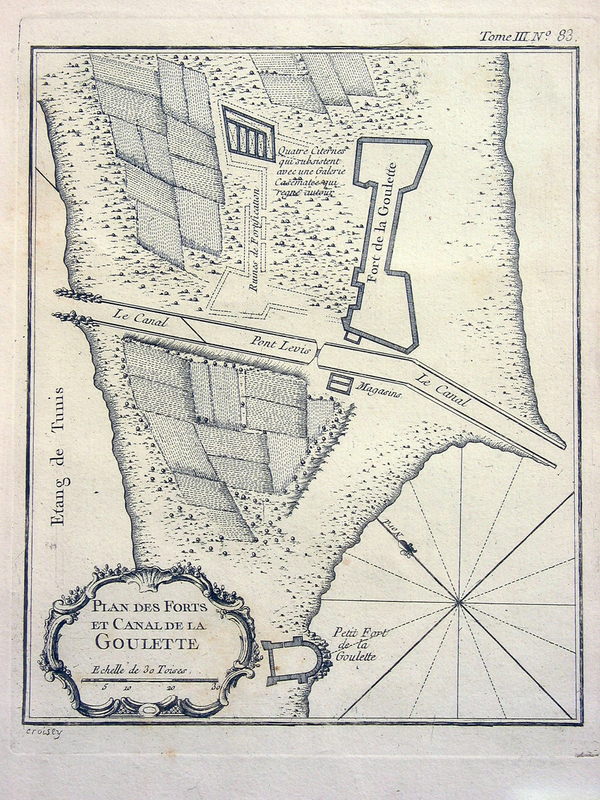 "Plan des forts et canal de la Goulette," online in Digital Library for International Research Archive, Item #5, http://dlir.org/archive/items/show/5 (accessed April 21, 2019).